Singapore Freebies: Bossini Opening Special: Free Foldable Trolley Bag with ANY Purchase!! 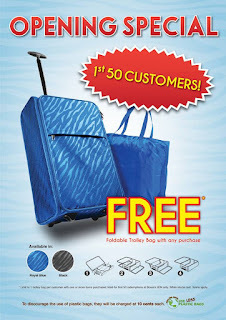 Bossini Opening Special: Free Foldable Trolley Bag with ANY Purchase!! Bossini is a widely recognized mass casual wear retailer with the brand message of “Be Happy!”. With this, Bossini aims to spread happiness to customers in the form of affordable yet quality fashionable clothing that assures comfort. L'Oreal: Register for Free Youth Code Samples!! True Yoga: Free Yoga 1-Session Pass Giveaway!! Subway: **One Day Only** Buy 1 Free 1 Promotion!! J. Co: J. Cool Couple Buy 1 Free 1 Promotion! !